PWA is blended with designing elements and other technologies & features that are typically related to native apps to a mobile browser. It feels like an app but runs within the browser. The PWA runs, self-contained in an app like experience and ensures the speed of access and reliability, even in the areas of low connectivity. Amalgamating user experience offered by its native application with this new mobile web experience, it offers seamless access and the best of both app and web worlds. Without taking up valuable Smartphone memory or data, PWA in mobile web experience works on-demand and is always accessible. It loads much faster and consumes significantly fewer data and storage being much lighter than a native app. PWAs have led to an average 68% increase in mobile traffic for a business that adds 15% faster load times, 52% increased conversions, and PWAs consumes 25% less storage than native apps. PWA load times decrease by 50% in comparison to its native app, leading to longer session times and increased engagement. Both of the apps native & PWA can function offline, send push notifications, having mobile specific navigation, and are accessible through home screens. But PWA doesn’t need downloads and can be discovered without going through the app marketplace. PWA looks & feels the same way as a native app from the user’s perspective & enhances the user experiences. We have seen the benefits of PWAs. Now the question is- how to engage more customers? Sounds tough? Because a history of web engagement is much lower than mobile apps. Push Notifications: One of the best ways to engage more customers is by sending a push notification. Users are in complete control of how it happens. Create new channels: You just need to create new channels for different aspects such as newsletters or sales. People will spend more time using your PWA than they will when they are browsing your mobile site. Is PWA is the right choice? Now you have read about all the benefits of the PWA, now time for your decision. While you do not need to start implementing PWAs immediately, investigate them and apply the practices in a future mobile app development project. If you choose to carry out support now, however, your websites will automatically run as PWAs on any new browser that adds support in the future. Progressive web apps are the next big things for the mobile world. As they combine the mobile apps and mobile browsers with the features and benefits of implementing PWA. Many mobile app development companies are there who had so much success after launching one. These apps increase user engagement and led to more conversions. So, what do you think, is PWA is right for your next project idea? The decision is all yours. 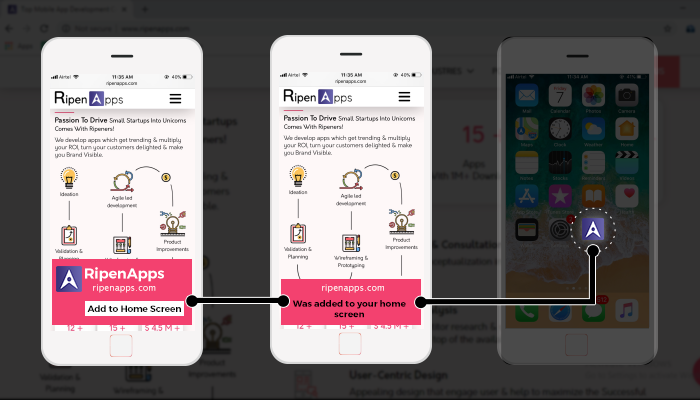 But if there is any query related to this, then drop us a mail on info@rippenapps.com, we will assist you with our 24/7 assistance support.